Although my subject expertise is in Medieval Studies, I often call myself a renaissance librarian for, like many of my colleagues, my job description serves as a set of loosely-defined and sometimes unheeded guidelines. According to my business card I am a cataloger, but I live daily within that protean phrase “other duties as assigned.” I also teach information literacy classes, provide in-person reference, monitor virtual chat queues, serve on search and advisory committees, conduct original research, debug websites, develop workshops, and perform other duties typically not required of technical services staff at USC. Keeping track of all these myriad and desperately varied activities requires a little discipline and a lot of technology. For the benefit of ULS Universe readers in similar situations, I want to share some of the digital tools that help me keep everything in sync, in focus, and in order. Working without a task list is fine if you have a single workflow, work in one location all day, or do not need to depend on others to get things done. If any of those situations doesn’t apply to you then you may need to keep a running list of your unresolved tasks. Remember the Milk [http://www.rememberthemilk.com/] allows me to create multiple lists and organize tasks within those lists based on location, duration, contingencies, context, priority level, and any other parameter I define. I have a list for each major area of responsibility (e.g. ACRL discussion group, research guides, professional blog) and tasks within those lists are organized primarily according to David Allen’s GTD schema [https://en.wikipedia.org/wiki/Getting_Things_Done] with help from Doug Ireton [http://blog.rememberthemilk.com/2008/05/guest-post-advanced-gtd-with-remember-the-milk/]. 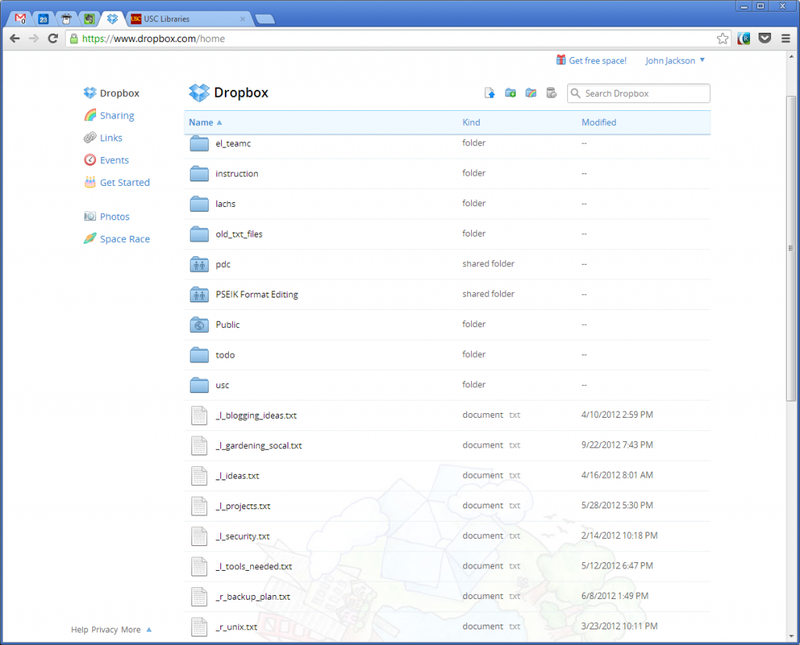 Between cataloging, teaching, and the reference desk, I never stay at a single computer for long but I often need access to my files at the drop of a hat, so for files that do not require high security I use Dropbox [https://www.dropbox.com/tour] for online storage. Dropbox provides cloud-based storage space for your files and syncs automatically with files stored on your local machine (desktop or mobile device). Not only does Dropbox give me access to my files anywhere with an internet connection, but it stores multiple, past versions of each file, providing backups in the unlikely event that one of my devices suffers a systems crash. While I use Dropbox to store most of my files, I have begun moving some files to Evernote [http://evernote.com/], a “ubiquitous capture” utility for managing not just text files, but also web clippings, images, and voice notes. Like Dropbox, it provides cloud-based storage space for my files, but the organizational structure is more similar to a three-ring binder whereas Dropbox mimics the typical file folder structure of most desktop computers. Evernote provides a minimal amount of metadata options (tags, location, URLs, folders) and automatic “smart searches” that make it a more robust option than Dropbox when it comes to organization. Specifically, I’ve started moving my instruction materials to Evernote so that I can organize them based on (1) class time needed, (2) expected learning outcomes, (3) tools/prep needed, and (4) format. This allows me to quickly pull together material for information literacy classes and share digital objects with colleagues. Despite my disdain for email as a communication platform, I cannot function at my place of work without it. Thankfully, it’s possible to route all my email addresses (personal, professional and otherwise) through a single Gmail interface and take advantage of Gmail’s robust filtering options [http://lifehacker.com/5861810/master-the-new-gmail-with-these-tips-shortcuts-and-add+ons]. 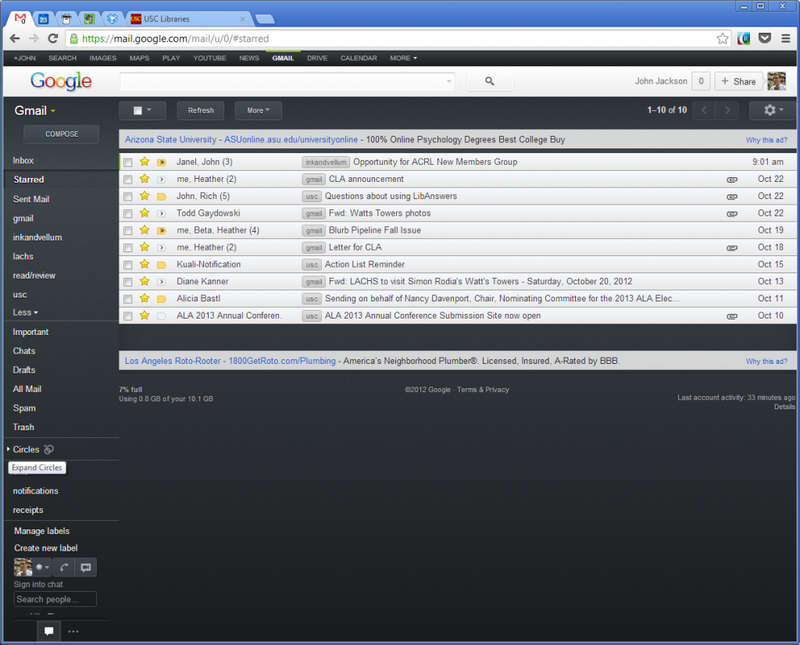 As you may have noticed, all the screenshots used in this post show my Gmail tab with a “0” unread items count. Through the science of filters, every email that comes into my inbox is automatically routed to an appropriate folder and, depending on the context and who sent it, will be starred if it needs follow-up action. I haven’t missed an important email yet and my inbox stays managed nonetheless. Finally, the one additional window that I keep open on all my devices at all times is my Twitter stream. Aside from providing me with up-to-date information on library issues, current technology, trends in academia, and the doings of my colleagues around the globe, Twitter is a constant reminder that my problems are not unique, that my experiences are often shared, and that I’m not alone in this vast sea of digitally networked information. All of the tools described above are web-based and have both iOS and Android apps and so they are always accessible anywhere with an internet connection. I hope you will find them as useful as I do. Good luck out there!